← We should have never adopted the poodleshooter! Given the typical attraction of predators to injured prey, contingency planning is prudent. This entry was posted in hoster, interesting people, pistol, prey, self-defense, weapon and tagged 380ACP, Bladetech, crutches, keltec, kydex. Bookmark the permalink. 8 Responses to Slower on her feet, no slower on the draw. A couple of years ago I took LFI-I from Massad Ayoob. One piece of advice was to get a holster for your non dominate side before you need it and to get at least some practice with it. He broke his right, dominant, wrist and realized he had no good way to carry a firearm. With or without the crutches, she makes me hungry like a wolf. Правильный подход к снаряду, мне кажется. Надо добавить левую кобуру и обе кобуры снабдить легкоизвлекаемыми ножами. К сожалению, нож часто оказывается эффективнее ствола в близком контакте. Разработать, что ли, специальную модель? На базе шейника – и не порезаться, априори, при наличии минимума мозгов, и работать можно в нулевом диапазоне. I wish the US medical community would get with the times and stop issuing that style crutch. It causes the patient to place undue pressure on the nerve plexus and brachial artery in the armpit which ends up leading to a variety of issues in the hands. What good is it to have your sidearm and have lost sufficient use of the hand that you cannot effectively grasp your sidearm? 30 years ago I was issued a more modern and better crutch following a spiral fracture of the tibia (non compound luckily) – at least I retained use of my hands courtesy of the crutch design. Thank you for this one, Oleg. I’m intermittently disabled and at times have to use canes, arm braces (“Canada” canes) or a wheelchair for mobility. It’s greatly increased my feeling of vulnerability. 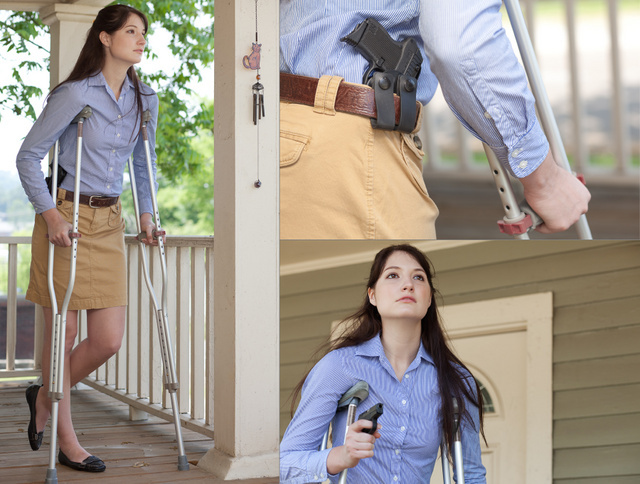 I shift my holster forward or backward depending on which mobility aid I have to use. I need to spend more some time working my draw when I’m using the braces. @Tiny – I used that style of crutch for nearly 18 months, back in the late 70’s and the physical therapists trained me not to let the crutch apply pressure in the armpit. This is a very good point; people who say “well, just run away” to folks who’re worried about being targeted by predator-folk tend to forget that not everybody’s young and in the peak of condition. After my last knee surgery(or next to last. I forget), I had the same problem. How to carry, and on crutches. I tried to practice getting to a real gun, and couldn’t. An airweight in a hooded sweatshirt was the best I could do.